A Hard Day’s Night might have, like so many similar films meant to cash in on the success of a pop musician or singing group, been completely disposable, forgotten as soon as the band’s hold on the popular imagination waned. Quite a few films made for this reason are justly forgotten, revisited only by the dedicated fans or those wanting a feel for the era the films were made in. Thankfully, the film is a joy to watch, still fresh feeling to this day, in spite of the fact that much of the style, right up to the Beatles then refreshing and now toothlessly cute antics, are now as standard as the clichés the film was avoiding. Director Richard Lester combines a black and white documentary aesthetic with the playfulness of his later films, including this film’s follow-up Help! 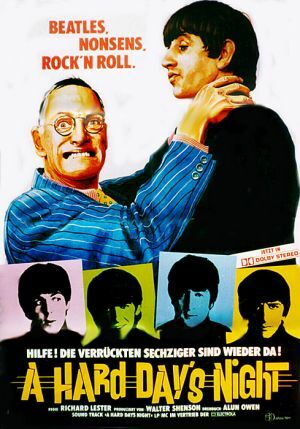 The film follows the Beatles over a couple of days of “routine”, going from a rush to escape fans and make it on a train to a studio shoot for a TV broadcast where the lads clash with the stuffy director (Viktor Spinetti, who appears as a scientist in Help!). In between the band’s managers Norm (Norman Rossington, Sharpe’s Regiment) and Shake (John Junkin) attempt to keep the group under control and on time, while Paul’s grandfather, John (Wilfrid Brambell, Witchfinder General), gets himself into mischief, turns Norm against Shake and convinces Ringo that the others disrespect him. The Beatles are actually given more to do here than in Help! and acquit themselves admirably, displaying a lot of good-natured humor and charisma, and apparently ad-libbing many of their lines, though Ringo gets to steal the show when playing off of Brambell and Harrison as the put-upon “manager’s pet” of the group. They are well supported by the rest of the cast, and by Richard Lester’s direction. As with Help!, if you are a Beatles fan you should already have seen this; if not and you are not morally opposed to the band, it’s worth a look just for the beautiful black and white photography, Lester’s direction, and Brambell’s delightfully mischievous “clean” old man. This entry was posted in Black and White, Comedy, Full Reviews, Music, Reviews, Slapstick and tagged Britain, cash-in, casino, dirty old man, George Harrison, get to the show, hysterical fans, John Lennon, musical interlude, Paul McCartney, pop, Richard Lester, Ringo Starr, The Beatles, United Artists, Viktor Spinetti.